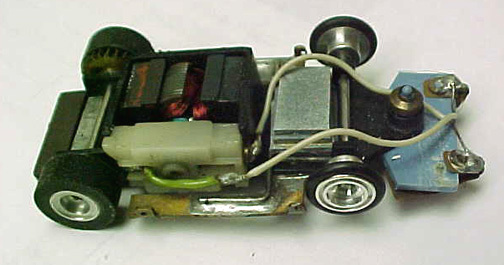 Following is a narrative that was copy/pasted from an internet slot car bulletin board. RiggenHO takes no credit for the information. Authored by "Dr Pea", Phillipe de Lespinay....noted Slot Car Historian (author of the book VINTAGE SLOT CARS) and owner of the website Electric Dreams. The story began in May 1970 when I was hired by a consulting company by the name of Innova Inc., based in Playa del Rey in California. 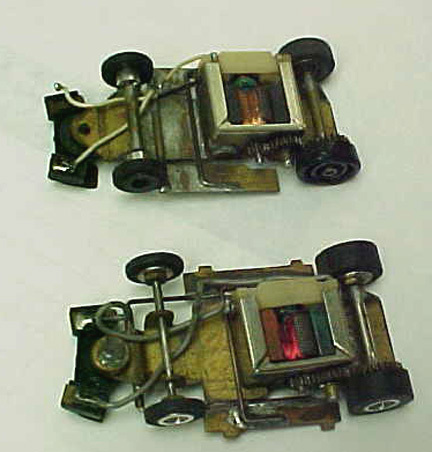 Matchbox was one of their clients and wanted to enter the HO market to compete with Tyco and Aurora. They wanted something revolutionary and performing much better than the T-Jets and the then brand new Tyco-Pro cars. 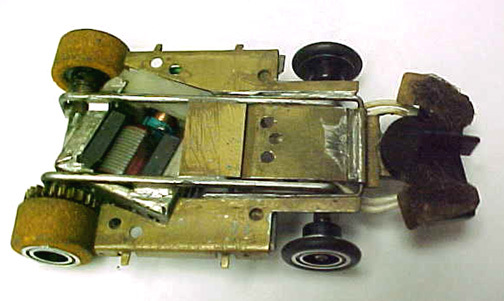 I was put in charge of developing the vehicles, and devised an idle-winder car as weight distribution sounded ideal for the job. 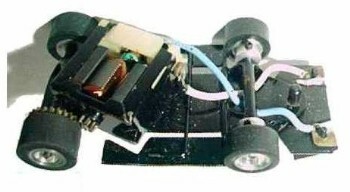 The car used a shortened version of the Mabuchi ST-020 motor like in the Tyco car, but the intention was to produce a much smaller unit for production. It ran terrific and much smoother than the competition, but tire grip was still a problem, so I purchased every possible tire I could find. The Twinn-K silicones were the best but the car still snapped too easily at the limit. Then by accident, I dropped a small bar magnet over the track rails, and I as I pulled it, I felt the resistance and "saw the light". I glued the bar magnet at the back of the car, and voila, instant and permanent traction by implied down force. We demonstrated the car to Matchbox in their Los Angeles office along with cars from the competition, and they were so impressed that they committed a large amount of capital to put the system in production along with new revolutionary controllers and better track. I then left Innova and offered the idle-winder to Al Riggen of the Riggen Manufacturing in Gardena, CA, but he was dead-set against the use of the magnet, claiming that it would "ruin" the hobby. 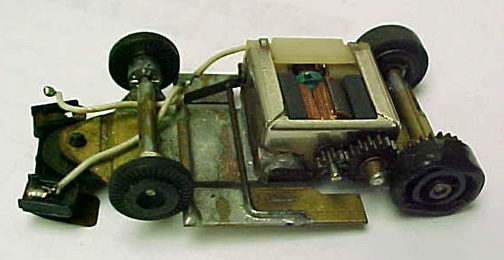 Since I needed the job, I accepted the employment offer anyway and helped them design what became the well-known Riggen inline HO car with the "shaker plate". 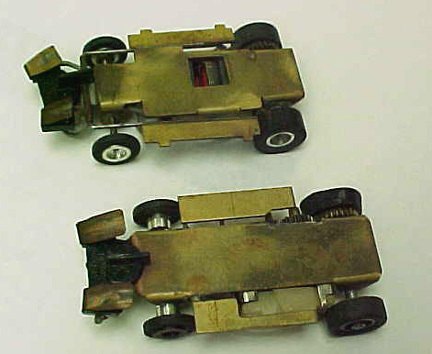 Note that one of the brass prototypes has the same body-mounting tabs as on the Riggen car, that's were they came from. 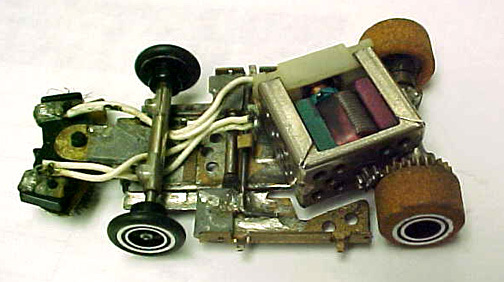 Al also built 5 more idle-winder chassis for the stock Mabuchi motor, and commissioned Gordon Brimhall to make a new very wide Chaparral 2J body. 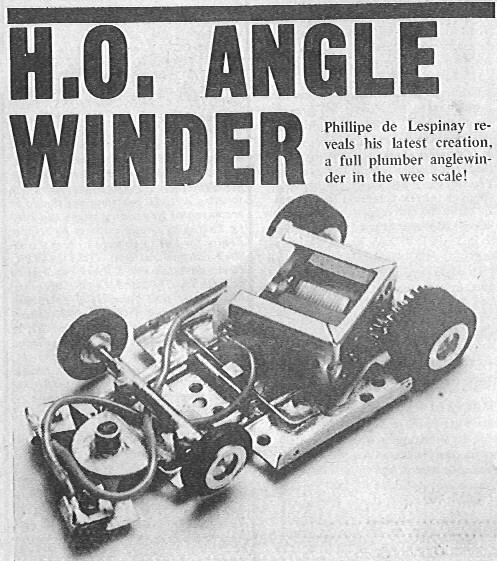 We went to the Chicago Hobby Show in February 1971 and were one of the stars of the show, with our 3-lane track and idle-winder cars that were so much better than what Aurora or Tyco had to offer. The prez of Aurora actually tried to entice me to go to work for Aurora in a private meeting at his posh hotel downtown Chicago, but I declined as there was no ! @#$% way I was going to live in NY, a city I deeply hate, even for the large amount of money he offered. I met Pat Dennis of Tyco at the show, and drove his version # 2 of the experimental Tyco sidewinder HO car he later exposed in the pages of Car Model. The car was impressive and faster than mine in top speed, but mine was obviously faster anytime the track would no longer be straight, so I felt that I still had the technical advantage over anyone then. Shortly after the show, I had a personal dispute with Al Riggen (my own fault really, I was younger and none the wiser) and left the company. 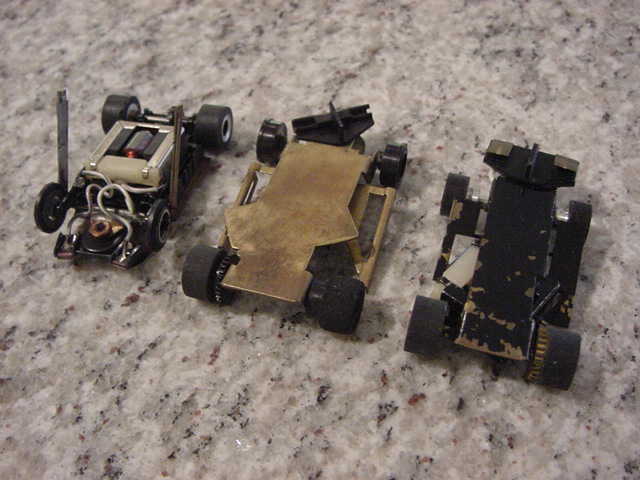 I went...pro-racing 1/24 scale cars for a living, quite successfully at that. I also spent some time helping Dynamic get their angle-winder HO car off the ground, but they really made a mess of it. Dynamic's "Hi" Johnson would not hear of the traction magnet either. 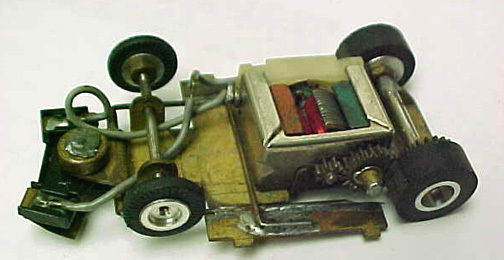 By that time, Tom Bowman's modified Aurora car with magnets had been shown in Car Model Magazine and was hailed as a "revolution", which made me smile quite a bit... My own "secret" car was shown over a year earlier in the pages of Miniature Auto Racing but with the body over it. 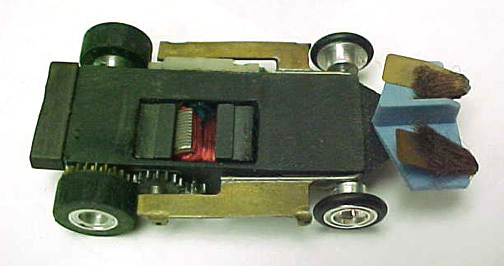 In mid 1973 I was contacted by the Cox company and accepted a very good employment offer, and designed their SuperScale 1/40 scale cars, the world's first production slot cars to feature a traction magnet. 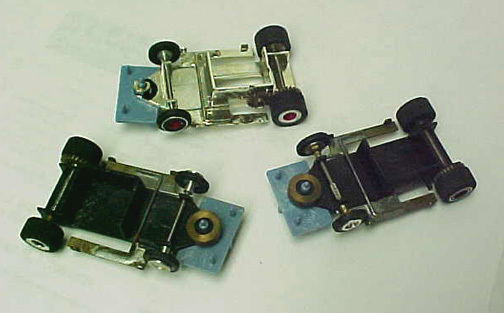 What you have in the pictures above are the first elucubrations that led to what every modern production slot car depends on for traction.